The telescope is mounted on a fixed-angle wedge so that when the pier head is leveled, very little additional adjustment is needed. I used drift alignment to judge adjustments to the leveling screws and rotation of the wedge. This gave pretty good results at the end of last Summer, but was tedious. The adjusting screws on the pier head are not easy to turn. This summer I had to remove the telescope from the pier to fix a problem with the Meade mother board electronics. That problem actually took me about eight weeks to diagnose and repair. When I put the telescope back on the pier, I found the declination drift to be very bad. So once again (Oct 2011) I brought out PoleAlignMax and used it to realign the polar axis. The telescope was about 5 arc-minutes away from the NCP. This was not as bad as I thought, but it was enough to make autoguiding difficult (it's difficult enough for my Meade mount). Once again it took me about eight iterations to make the adjustments, because I had to change both the elevation and the azimuth. Along the way, I managed to increase the misalignment significantly. When that happens, PAM often won't be able to solve images. 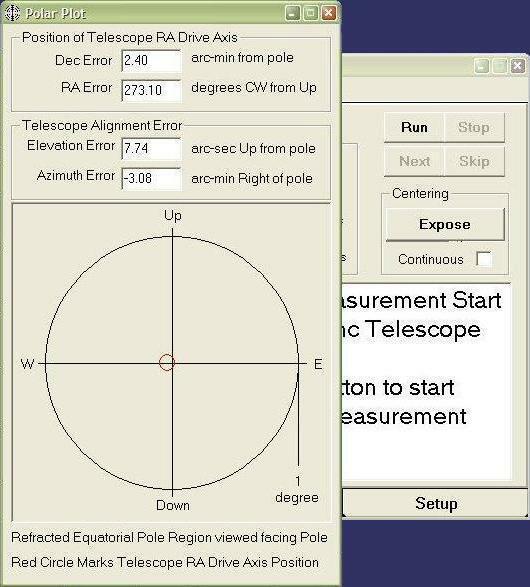 I left the elevation a little bit below the pole, so that any guiding corrections in declination would be applied in the same direction consistently. Immediately below is a screen image of the 2006 iteration (left), showing the log file and the polar diagram of the displacement, along with a dump of the log file. 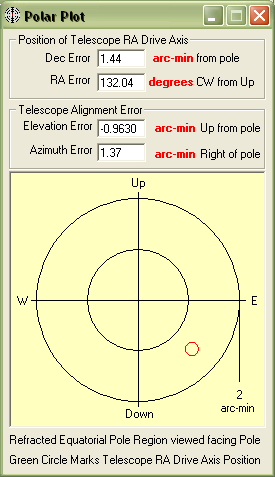 In the summer of 2006 I fired up PoleAlignMax for the first time and determined that the polar axis of my telescope was about 8 minutes of arc below and 40 seconds of arc to the west of the North Celestial Pole. Based on those results, I made fine adjustments to try to get within a minute of arc or so in both coordinates. It was easy to raise the polar axis of my mount by 8 minutes of arc, although it took six iterations to get there. Below is a screen image of the 2006 iteration (left), showing the log file and the polar diagram of the displacement, along with a dump of the log file. PAM won't work to completion if any one of the three images can't be solved. When all images plate solve, PAM works without a failure. I got plate solving to work because I first used ACP to run the SyncScope script. This guaranteed that PAM would solve the intial image correctly. I also set PAM up to slew only 7 degrees between images so that, even with bad polar alignment, the second and third images would also solve. Contrary to PAM instructions, it is not necessary to find and sync on a bright star. Syncing on any field is just fine. 22:41:13 Step 1: Found 22 objects in image. 22:41:14 Step 2: Found 106 catalog stars in area. 22:42:51 Step 1: Found 17 objects in image. 22:42:51 Step 2: Found 80 catalog stars in area. 22:43:37 Step 1: Found 14 objects in image. 22:43:38 Step 2: Found 91 catalog stars in area.